You Too can be a Hero! Wouldn’t you rather leave your money to your family? Yes, it is possible! You can be a hero because you’ve got a “guy”! At some point in your life, you will know of a friend or loved one who will need care in their later years. Unless they are wealthy or have LTC insurance, they will rapidly spend down to impoverishment and end up on a program called Medicaid which will pay for long term care once your wealth is all gone. Life insurance must also be cashed in to qualify for this. However, little known Medicaid rules do allow one to gift some money to their family if done in the correct kind of trust. This can be done shortly before entering a LTC facility or even once already in one. I’m Romeo Raabe www.TheLongTermCareGuy.com here in Green Bay. I work all across the state of Wisconsin offering LTC insurance as well as setting up the trusts that allow you to move some money to family without any Medicaid penalties for gifting. It is in their rules. I also teach this to insurance professionals, financial planners, CPA’s and others. Recently I had several employees from the Wisconsin Board on Aging and Long Term Care in classes on this that I taught in Madison. There is no cost or fees to set up these trusts. The money in them earns interest. Setting one up for yourself prevents your children from having to pass the hat to fund your funeral because Medicaid required your life insurance to be cashed in before receiving Medicaid. 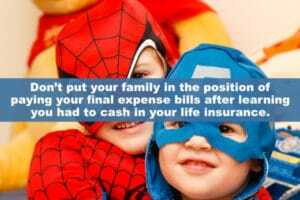 Don’t put your family in the position of paying your final expense bills after learning you had to cash in your life insurance. It is far better to leave them money that you did not believe was possible to do. Here is where the hero part comes in – If you know of someone facing this dilemma, you can be the hero who says “I know a guy who can help fix this problem”. You can help them learn how to save some of their money for their family. You will truly become someone’s hero. Learn from the video below how money can be protected for family! Children’s spouses are included as well to protect even more! Wouldn’t you rather leave your money to your family? Yes, it is possible! Call us at (920) 884-3030 to get started!